There are currently 88,691 users on this website. I have had the seller's site bookmarked for about 2 weeks since I first saw this coin. Today I decided to grab it. I kept going back and forth because the condition is not great. Then again, this is the first one I have seen for sale. This coin is part of the first issue for Domitian of 82 CE. According to Buttrey and Carradice "The denarii of the first issue of 82 use the same eight main reverse designs as the last issues of 81"
Though the coin has some wear, the reason I bought this was threefold. First, I did not have a coin from this issue. Second, I really liked the character displayed by the obverse portrait. Also, the reverse devices are quite clear and recognizable. 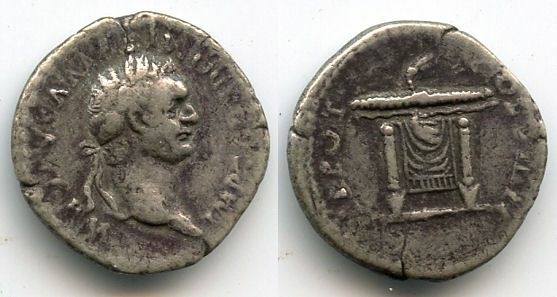 I have a few more coins of Domitian on my watch list for next week. I hope I can land at least 2 of them. I am really enjoying the process of tracking down these coins and then searching the reference books for additional information on them. It is a lot of fun. In general I have also learned how many attributions are just plain wrong. This is an example of where having the book is necessary and helpful. Please post your coins of Domitian. RIC 101; RSC 597; BMC 26. Excellent pickup. What an expressive portrait - Domitian appears to be scowling, maybe expressing derision. In any event he doesn't appear to be a happy camper here. Very interesting reverse type too. Another excellent coin, you are building some collection of his denarius.